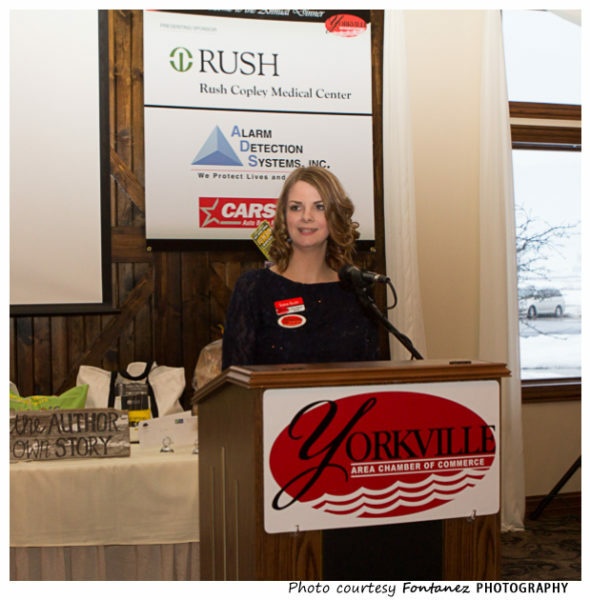 The Yorkville Area Chamber of Commerce wishes to thank all who attended, sponsored, or volunteered at the Annual Dinner on February 15. With Rush Copley as Pr esenting Sponsor, the dinner was attended by 268 members and guests who enjoyed the ambiance, excellent service and delicious filet mignon dinner at Whitetail Ridge Golf Club. 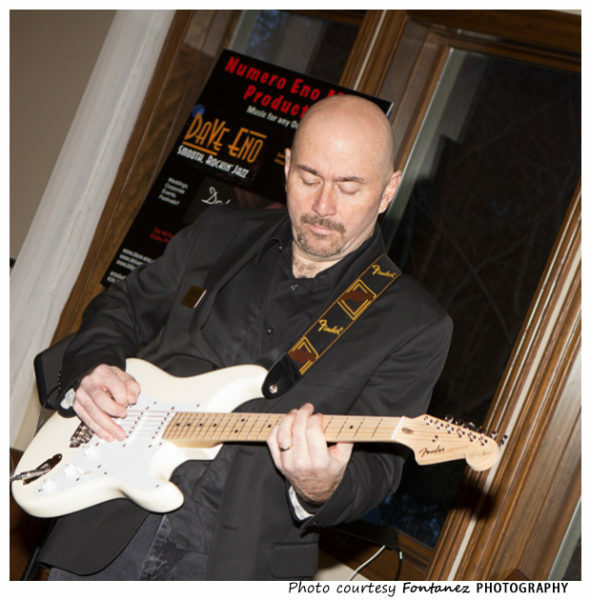 During networking guests enjoyed appetizers, “smooth rockin’ jazz” music by Dave Eno, and had fun making photo memories on the red carpet. A brief program was presented by YACC Board President Sarah Allen and Executive Director Sherri Farley, with a fun “get to know your board and staff’ trivia segment followed by awards presentations. Throughout the evening a photo retrospective slide show recapped images from the past year’s events, assembled by Sara Fontanez, Fontanez PHOTOGRAPHY, with Ben Kirkland and Jeff Norris of TCG Solutions supplying tech expertise. Special thanks to YACC staff Janelle Helfrich, Gina Conner, and volunteers: Sarah Allen, FNBC Bank & Trust; Stephanie Baumwell, Old Second Bank; Sue Bill, First National Bank; Don Duffy, Team Eagle Packaging; Roxanne Essex, Maggie’s Interiors; Sue Hills, Stifel; Sandra Hurtado, Harmony Aesthetics; Gina Johansen, Keller-Williams; Patti Kahle, FNBC Bank & Trust; Denise Krafft, First National Bank; Kyla McClure, FNBC Bank & Trust; Cheryl Pearre, WSPY-FM 107.1; Annette Powell, Kendall Printing; Stephanie Roskopf, Yorkville Auto Body; Mike Shepard, Hampton Inn Yorkville; Skip Sittig & Michele Sittig, Norwex. The Yorkville Area Chamber of Commerce, founded in 1971, is a non-profit 501(c)(6) organization. We are grateful to have the support and partnership of the City, School District, and more than 340 member-businesses. It continues to be our mission to serve these members and strengthen the business community through programming that incorporates networking, education, professional development, forums for political updates and connections, and partnerships. Member involvement in Chamber programs is recognized as a means for building stronger businesses, and we are dedicated to the promotion of Yorkville’s vibrant, connected business community. 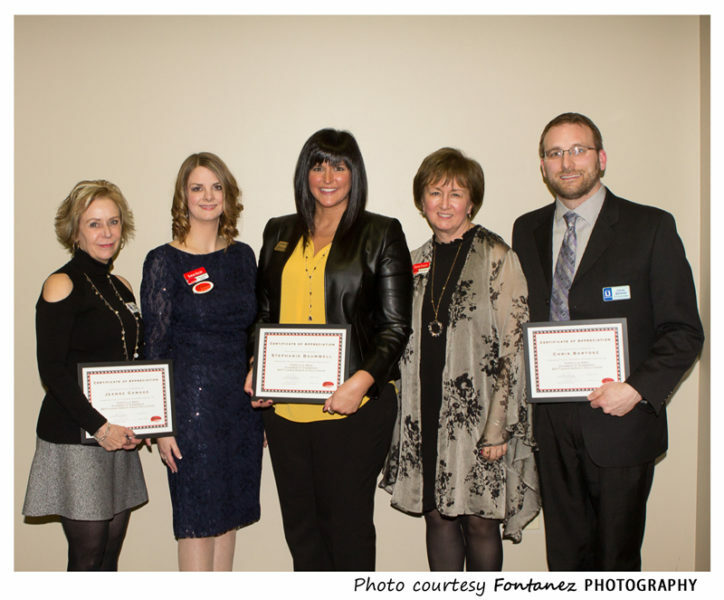 The Yorkville Area Chamber of Commerce gave special recognition to several businesses during the Annual Dinner Meeting held February 15, 2018. 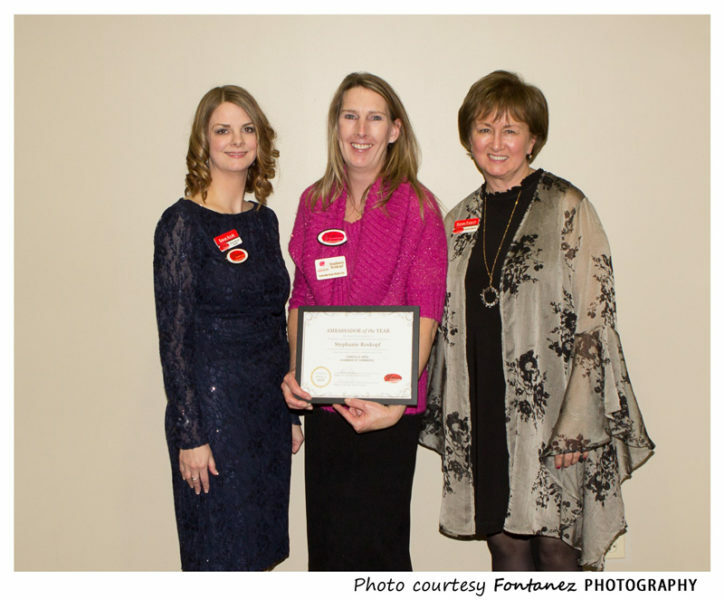 Presenting the awards were Chamber President Sarah Allen and Executive Director Sherri Farley. Accepting the Business of the Year award is Jennifer Perry, Director of Emergency Services, along with Heather Johnson, Manager of Member and Community Relations, Rush Copley Healthplex, and Susan Hines, Community Relations Coordinator. 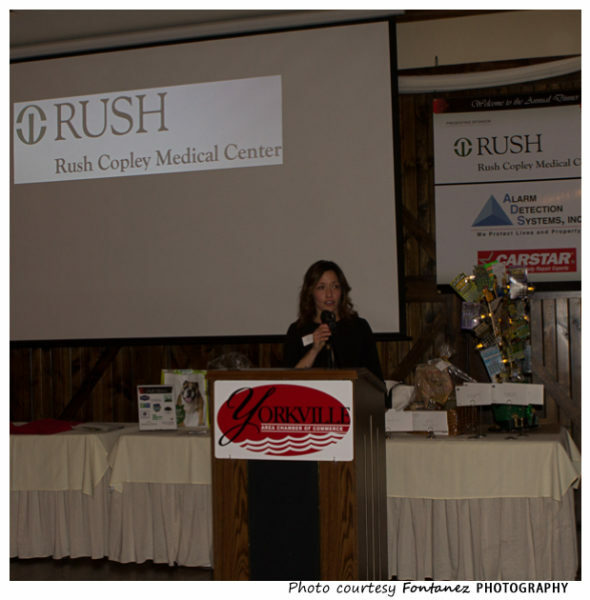 The Business of the Year award was presented to Rush Copley Medical Center. 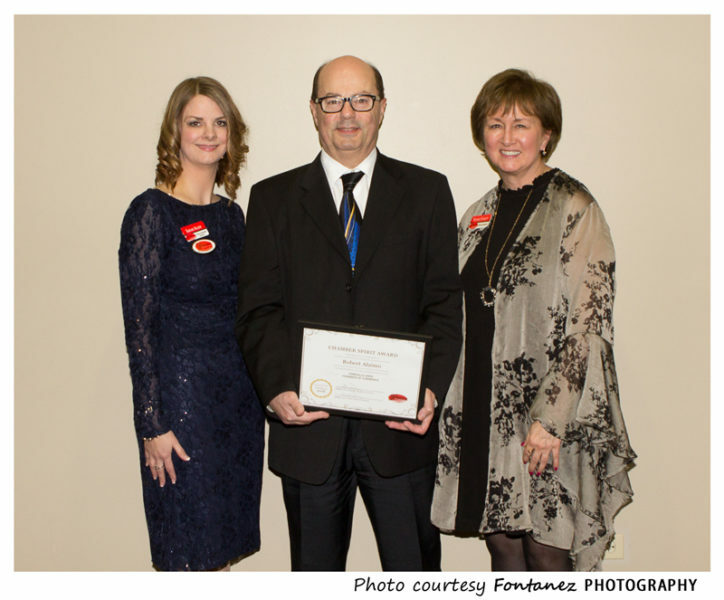 This award recognizes a business that makes significant contributions to the Chamber of Commerce and community through leadership, donations of labor and/or products, financial contributions, volunteering of personal time, service on committees, and more. 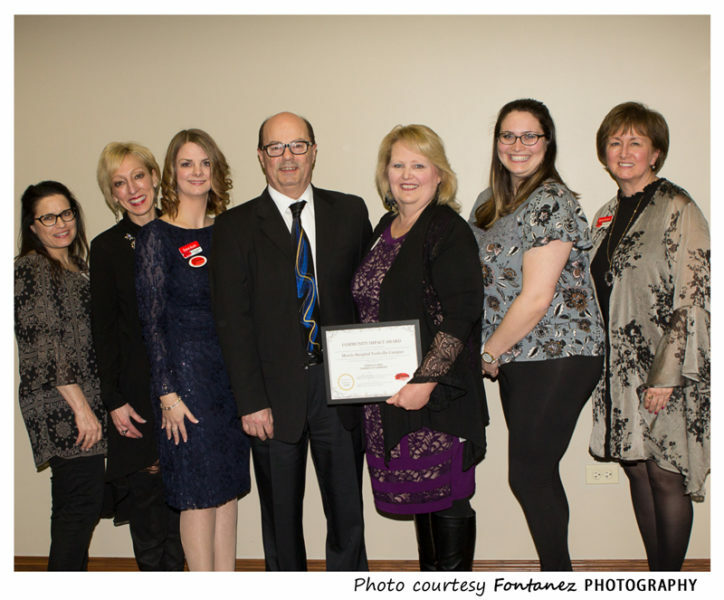 The Small Business of the Year award was presented to Fontanez PHOTOGRAPHY. This award recognizes significant contributions to the Chamber and community through leadership, donations of labor and/or products, volunteering of personal time, and service on committees. 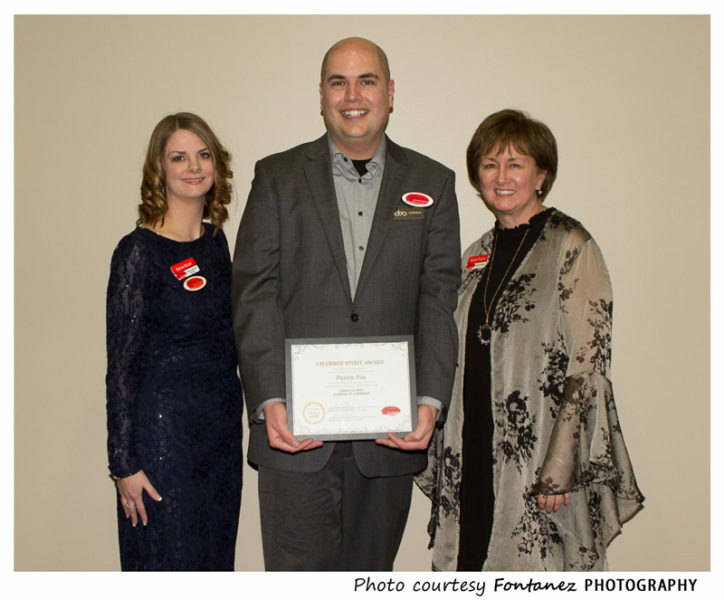 The New Business of the Year honor, presented to Stephen Alan Salon, recognizes the impact that a new member has made for the betterment of the Chamber membership and surrounding community. The Community Impact award, presented to Morris Hospital Yorkville Campus, recognizes the outreach and commitment made by a Chamber business to serve and enhance the community. This award recognizes an individual’s outstanding efforts to promote Chamber membership and member-to-member involvement. Two recipients, Robert Alaimo and Darren Fox, were selected for their above and beyond volunteer and service contributions. 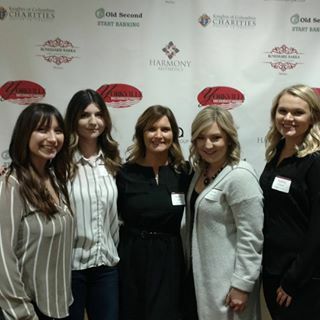 YACC Ambassadors are a volunteer group of members who, as part of an overall mission, have made a commitment to promote the growth and health of the Chamber and its member businesses while strengthening the local business community. Award recipient Stephanie Roskopf was selected for her outstanding dedication to promoting the Chamber and its programs.